Howdy! Where did we leave off in this wild adventure? Ah, when we last checked in we were making our way across the western part of Colorado. It’s good we made it as far as Grand Junction, because the next task was to get to Moab and Arches National Park in time to make camp and enjoy the park. That drive wasn’t bad at all, pretty flat, open land with scrub and sagebrush and an easy road to follow. Better have a full gas tank, though, as most exits had nothing at all, just a road that crossed the highway. Arches at last and yikes the line of cars and campers to get in was huge. It was Sunday and a crowd was not unexpected, but this looked more like the entrance gates to Disneyland. Jackie actually fixed lunch and we ate while moving slowly into the park entrance. This month the entrance fees just increased, but thanks to our America the Beautiful senior pass, we didn’t pay anything. Nice benefit for seniors! Ok, the entrance gate wait was a challenge, but then the ride began like one of the roller coasters as Six Flags. Up, up, turn on the switchback, up, up, switchback, click, click, click and you expect to start down the first drop off, but instead you level off a bit and the scene gets dramatic. 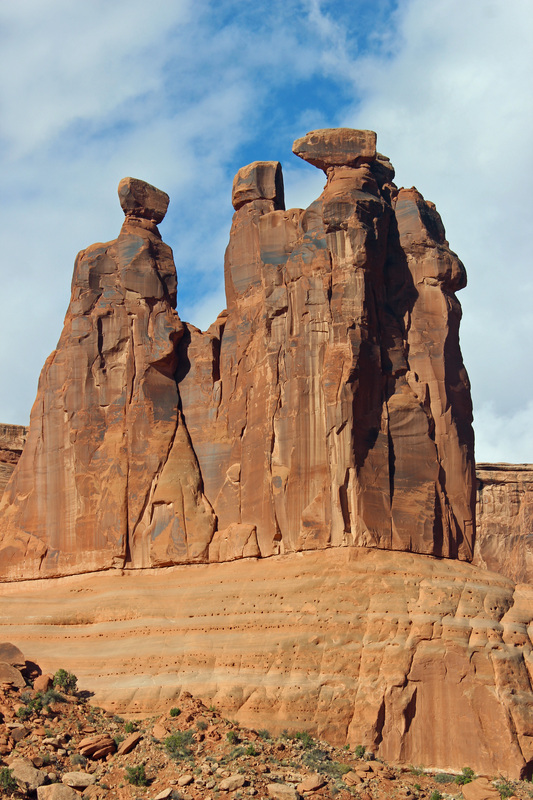 Huge red sandstone monoliths rise from the plateau in all sorts of shapes and sizes. Something of a cross between a giant chess set and huge “drip castles” – you know, the ones you make with wet, drippy sand at the beach? Absolutely breathtaking in size and scope. 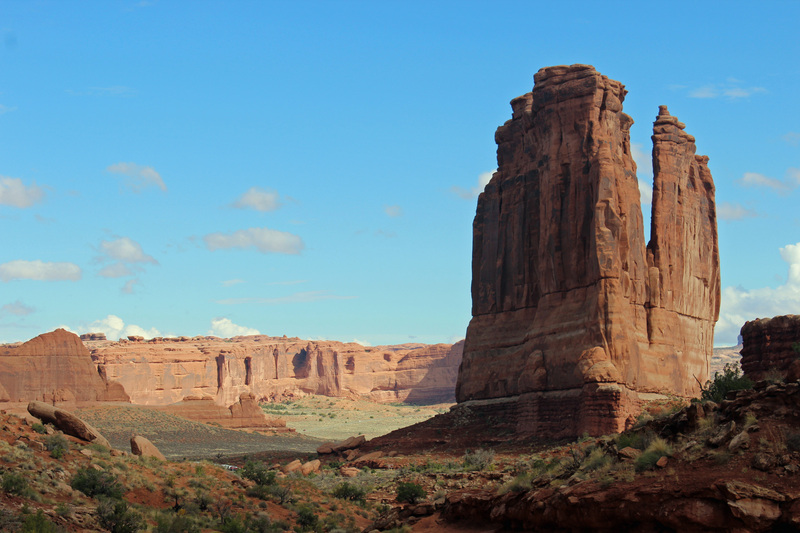 Arches has the most dramatic entrance of any national park. We wound our way along the roadway, up and down, some downshifting involved, each pointing out something different in our window (oh yeah, keep your eyes on the road, Doug). 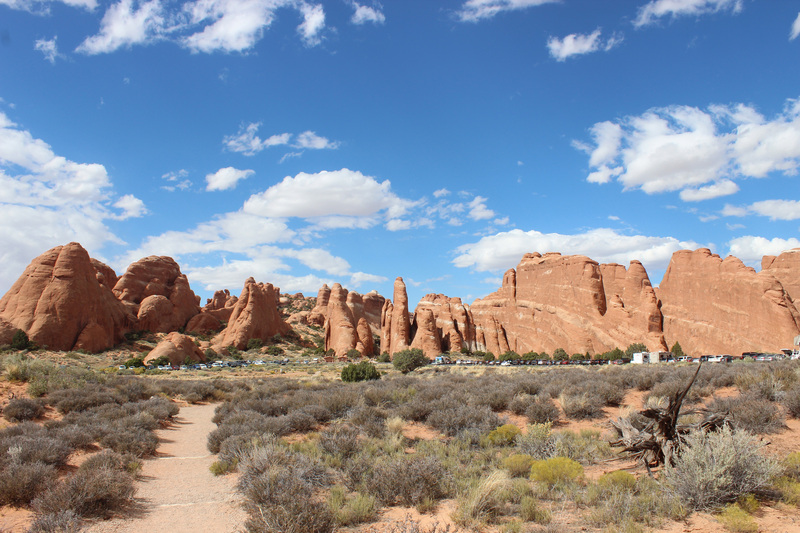 It was 18 miles to the Devil’s Garden end of the roadway where the campground is located. 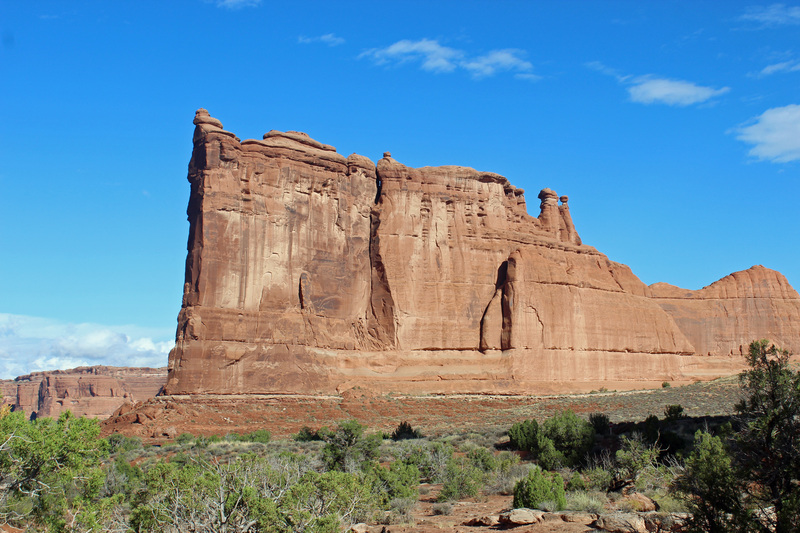 As you drive along, you look ahead to canyons and plateaus and notice way, way over there is a road with cars on it … oh is THAT where we are headed? Objects are farther than they appear in the mirror, or window. Lots of cars, and lots of rental class “C” campers along the way and several large tour buses. 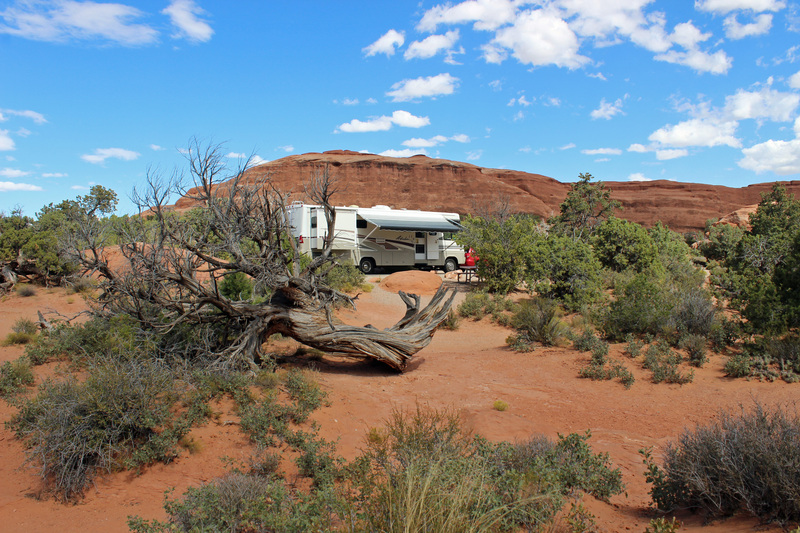 We pulled in to the campground, unhooked the car and drove to the campsite. Had to unhook the tow dolly to back in to the site, but it is fantastic. 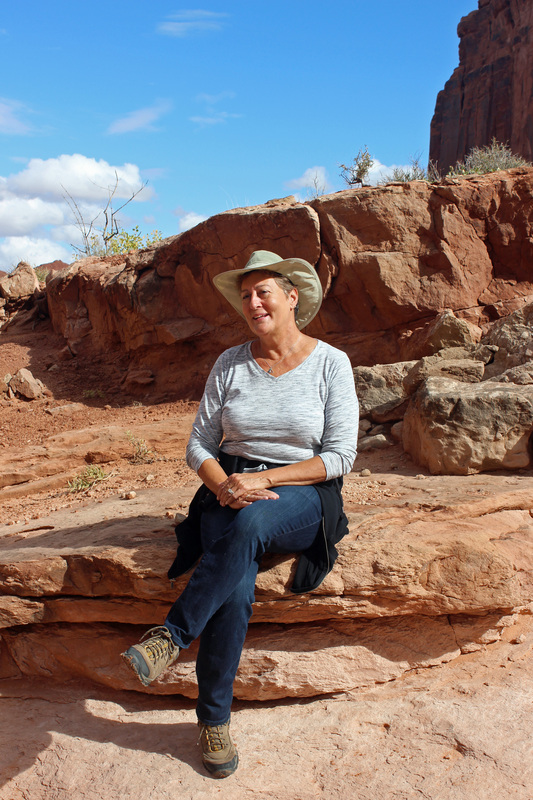 There are only 50 sites here, so each has plenty of space around it, with junipers, sagebrush and boulders, with a backdrop of red sandstone surrounding most sites. So cool. 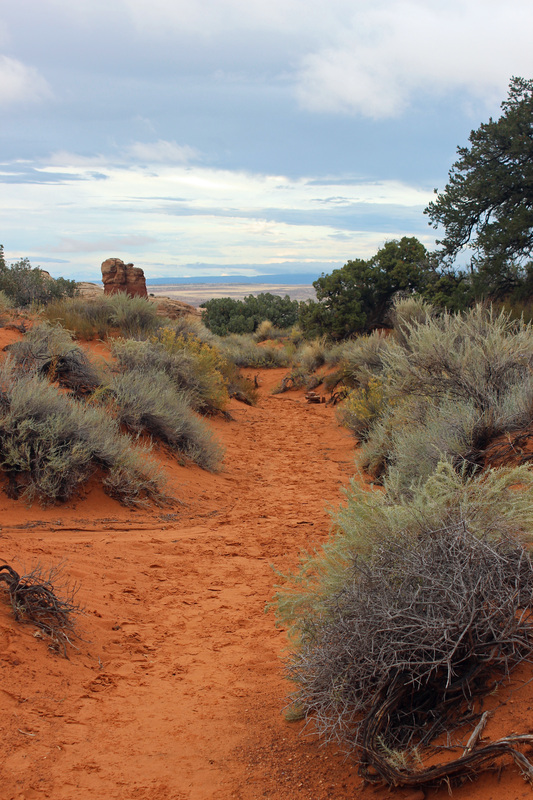 I guess if you could camp on Mars it would look something like this, minus the vegetation. It is dry camping, so we have to use onboard water, propane, generator and batteries. 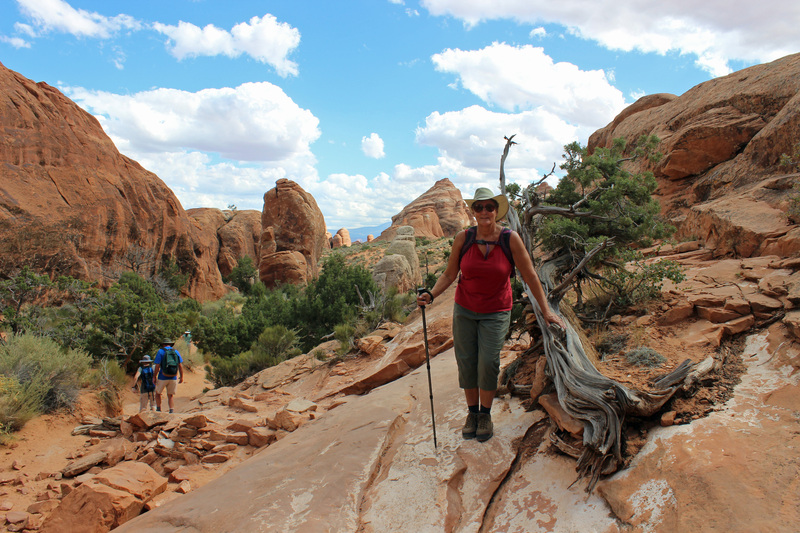 We quickly made camp and fixed our packs for a hike in Devil’s Garden. The trail maps we have say this might be a mile or so, not something that should be too difficult for us. Off we go, only to find ourselves on a nice trail that has so many people hiking with us, or more accurately, passing us. 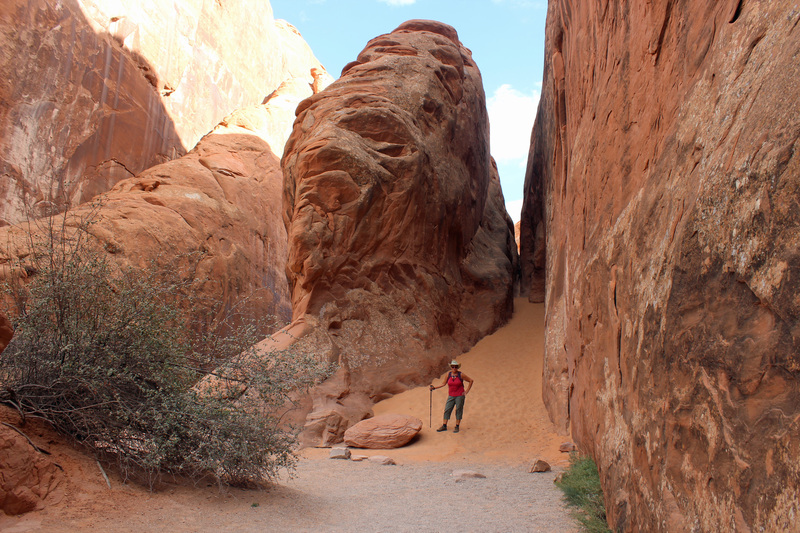 The trail was pretty easy footing up to Landscape Arch and then turned very sandy until we got to the base of the sandstone fins. Where did the trail go but up the slanted spine of the rock. Ok, that should be an acceptable challenge, but as we were climbing up the rock, the Von Trapp family went whizzing past us, led by the youngest practically running up and bouncing us off the rock. It was a busy day on the rock. 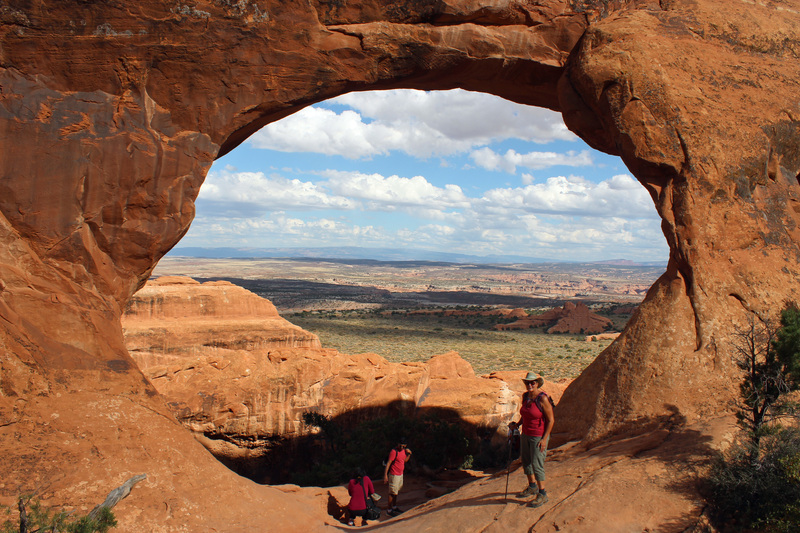 But once we got up to one of the summits and Partition Arch it was worth it. What a view. Back down, carefully, and we continued to be amazed by the folks hiking in, like it was nothing at all. The tour buses seemed to be filled with Chinese visitors, and let me tell you, those older women were not daunted by the climb at all. And taking pictures with their iPads. Well that can be forgiven, everyone, myself included, was taking pictures. You had to wait your turn at a few of the arches, unless you didn’t mind getting everyone else in the shot. We took a break back at camp and decided to go to see Delicate Arch before sunset, when the colors are brighter orange. 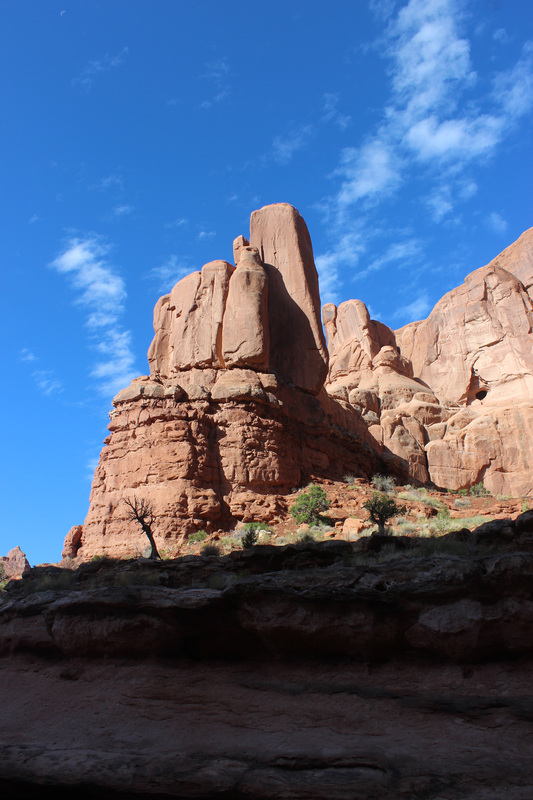 We drove to the area, decided to do the viewing area instead of hiking up to the actual arch. Good thing, as the upper viewing area hike seemed a half mile up anyway. 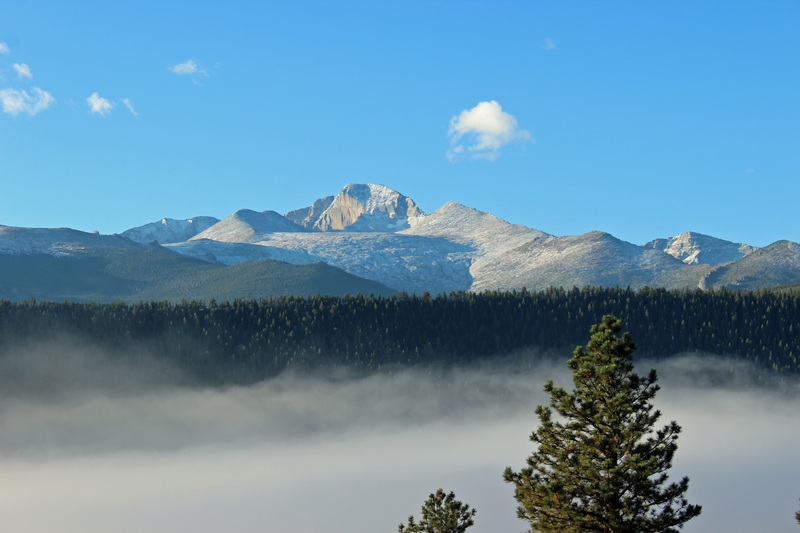 (My definition of a viewing area is like a scenic pull-off… you step out of the car, say “wow” and get back in. Guess that doesn’t apply here). We saw it, took pictures and since the sun was obscured by clouds, we headed back. 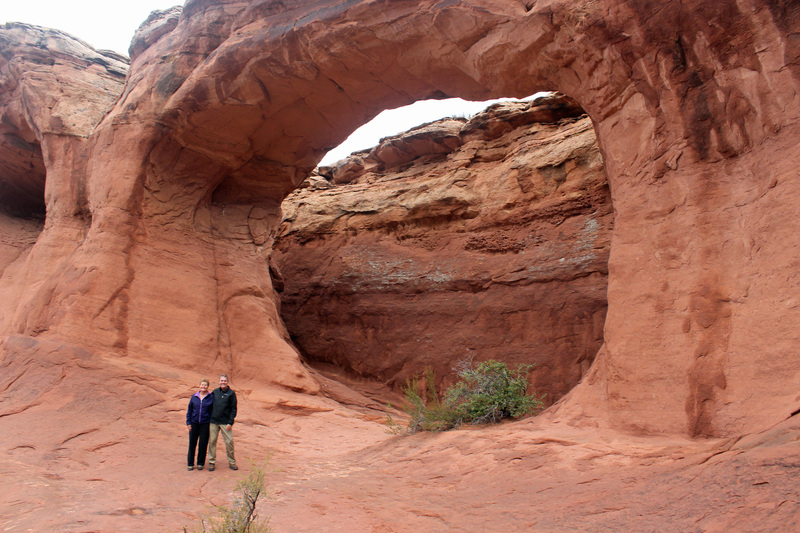 I didn’t think it was as spectacular as several of the other arches we saw. Showers overnight and light drizzle started things off today – seriously? Here in the desert Southwest? Well it is our full day in the park, so by golly we are gonna see them arches. 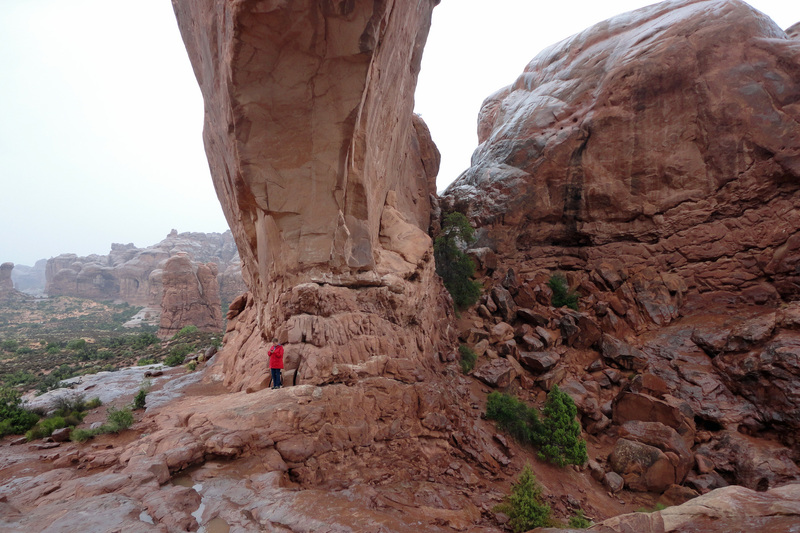 We went to a few that actually did have shorter hikes to them (Windows arches and Double arch). 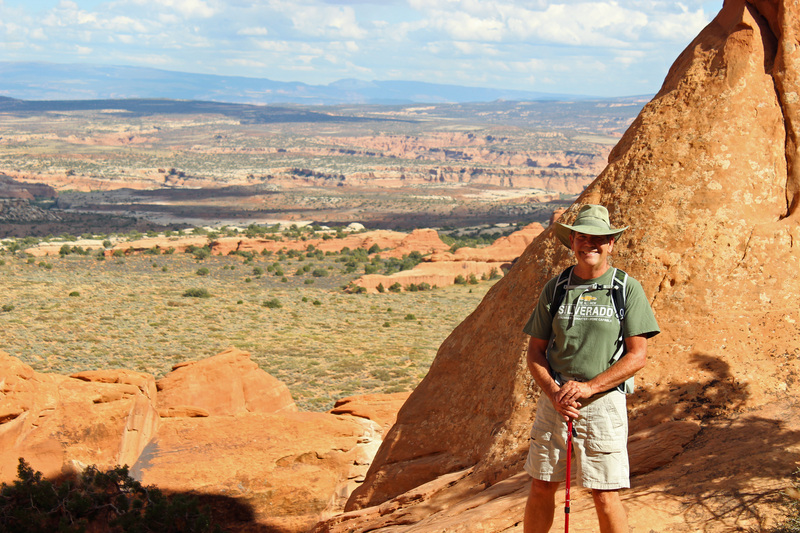 Then we agreed to try the trail to Delicate Arch to get that famous shot. What’s a little drizzle when you have the right gear? Besides, it is only 1.5 miles, with a 480 foot elevation change. Piece of cake. Umm, I think we just hiked up Stone Mountain – and because the rain continued to get worse, we didn’t make it to the arch, maybe only ¾ the way. Storm clouds headed our way were full of rain. As we found out, the roadway into the parking lot was now closed and beginning to flood. Nice challenging hike, though. 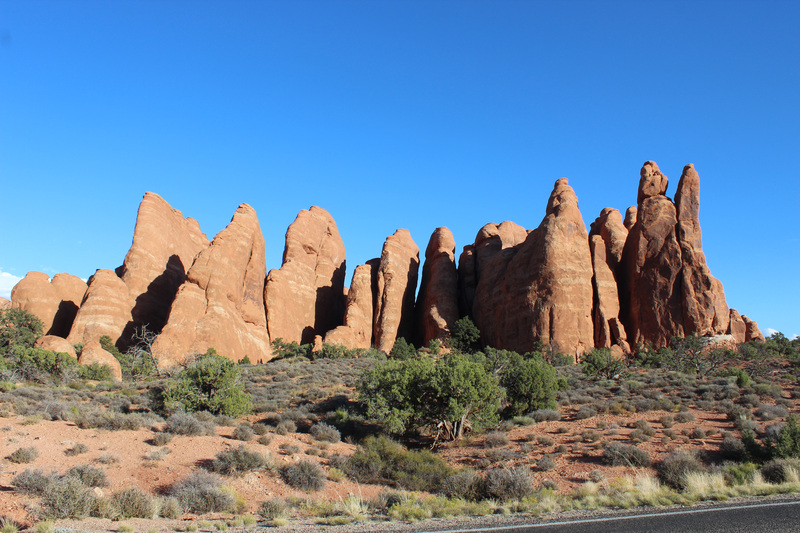 Some of it is across a broad stretch of open slickrock, where you follow the rock cairns (stacks) to find your way (or the splotches of chewing gum). Was cool seeing the rivulets of water running down and across the rock. Still, we were passed by more Chinese women who just kept climbing (no disrespect intended). 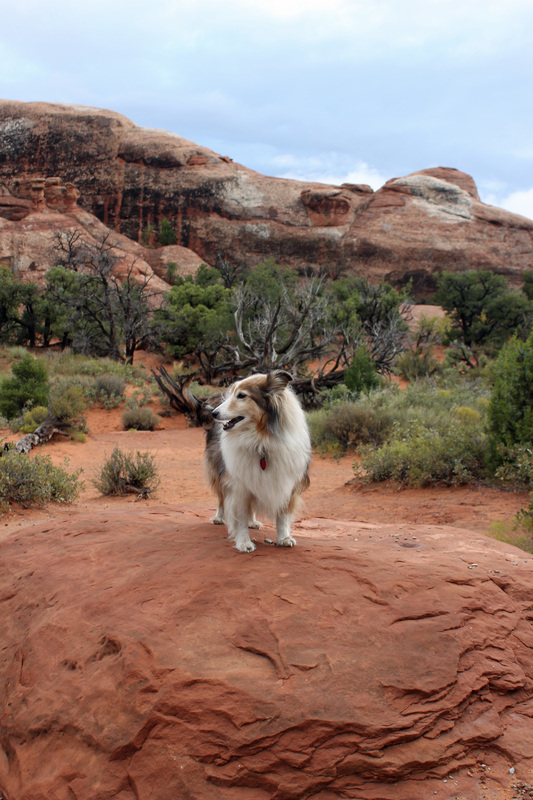 Oh, and more of the Von Trapp family was happily bounding down the slickrock trail, with little Gretta maybe only two years old. Just a little humbling (some disrespect intended). You have to picture this, though. It’s raining, no doubt about it. Yet folks in their disposable ponchos, shorts, tennis shoes, t-shirts, nice white pants, yoga pants, Little Mermaid umbrellas all make the pilgrimage along these trails heading … where? 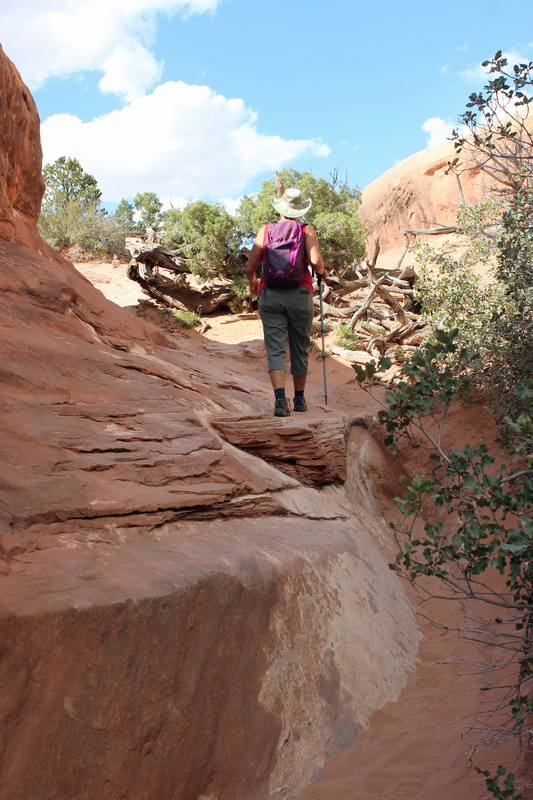 The end of the trail, which gets harder to distinguish as you go along the slickrock? Onward they walk, snapping selfies and dripping water. Why? Because the views and the landscape are uniquely otherworldly. Still, it almost seems as busy as the mall on a week-end. Even the parking lots are full. Now let me caution you about the National Park Service and their math skills. I don’t think they know how to measure distances. 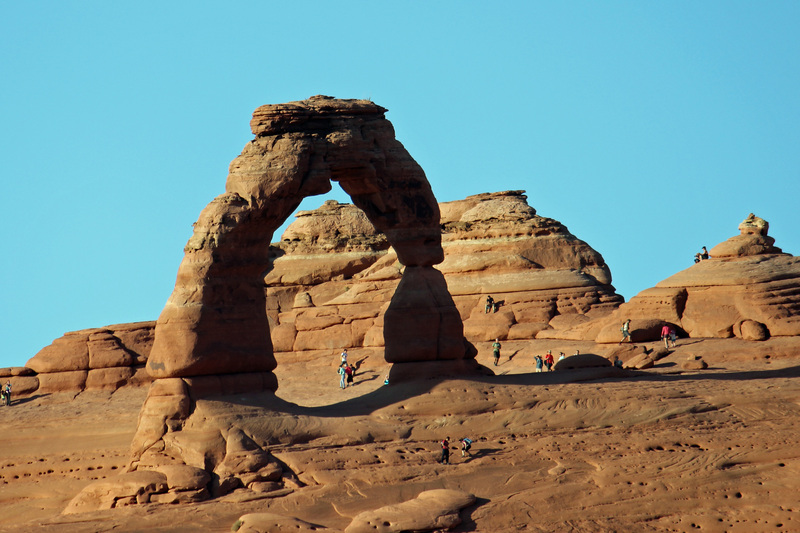 The trip to Delicate Arch viewing was supposed to be 100 yards roundtrip … no way. 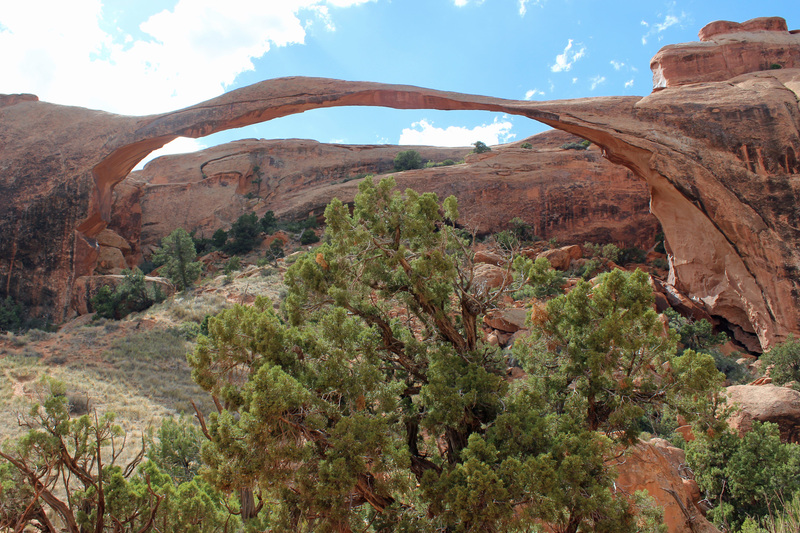 The trip into Devil’s Garden was supposed to be about 1.9 miles to the arch we saw, but Jackie’s phone tracked 8 miles round trip. 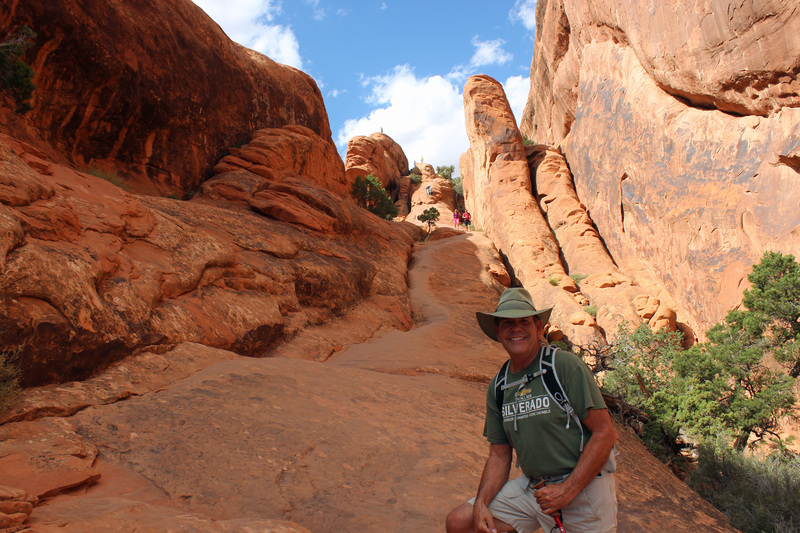 And today’s trek to Delicate Arch trail, listed as 3 miles round trip? We both tracked that at over 4 miles without actually making it all the way to the arch. Not sure how they figure it, but count on it being farther than you expect. As soggy as we were, it was an exhilarating hike today in the rain. A good personal challenge. Thank goodness we could go back to the van, heat up some soup and a quesadilla for lunch and put on the heater and change into dry clothes. 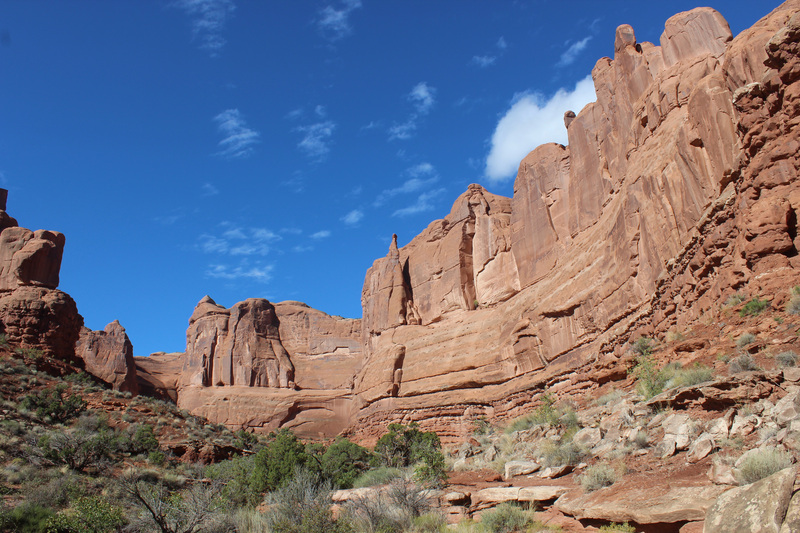 When we awoke the next day it was blue skies and warming, so as we drove out of camp we stopped for yet another hike into the Park Avenue section. 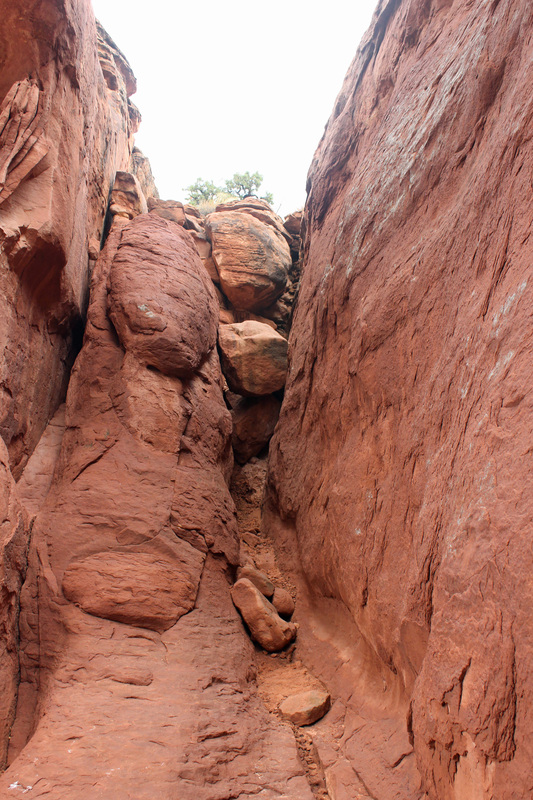 This area of sheer red sandstone walls seems more like you are walking through a huge old Roman city that has crumbled. Back in the car and camper and on to Moab KOA. Jackie drove the car with the tow dolly attached, which made the descent much easier in the RV. Nothing special about the KOA, except for a nice view of the La Sal Mountains, which now have a cap of white snow on them. A grocery run in town and dinner at the Moab Brewery, highly recommended by friends. Hey, thanks for checking in for our Week 3.